There are a lot of voters who think most politicians will say whatever it takes to get elected. I had coffee with a friend just this morning who dismissed Mitt Romney’s latest shift on abortion—he told the Des Moines Register that “There’s no legislation with regards to abortion that I’m familiar with that would become part of my agenda”—the same way. No big deal because politicians do it all the time. That sort of blanket cynicism blinds people to just how outrageously shameless and morally hollow Romney is willing to be. It’s gotten so bad that the following rule is no exaggeration: If Romney’s lips are moving and he’s talking about abortion, he is lying. Oh, sure, he put enough weasel words in that one statement that he could argue it’s not a complete lie. Although Romney wrote in the National Review last year that he would “advocate for and support a Pain-Capable Unborn Child Protection Act to protect unborn children who are capable of feeling pain from abortion,” he can claim that he’s not familiar with an existing piece of legislation that does just that. Similarly, the Romney-Ryan campaign website says, “As president, [Romney] will end federal funding for abortion advocates like Planned Parenthood.” But Romney doesn’t have to make that part of his agenda. He simply has to sign the bill a GOP-controlled Congress sends to him. But littering your speech with so many weaselly qualifiers that you can tell everyone that you’ve left yourself open to adopting their position is no virtue. The nation rightly mocked Bill Clinton for parsing the definition of “is.” And when your defense is that you haven’t technically lied, you’ve lost any claim to moral rectitude. Romney’s statement also neatly sidesteps the fact that a president doesn’t impact abortion policy by writing legislation, but through executive orders, judicial appointments, and signing—or vetoing—bills passed by Congress. Will Saletan has compiled the exhaustive list of every Romney shift on abortion which before yesterday stood at nine. The result is an astonishing document that makes it very easy to doubt whether Romney stands for anything at all. 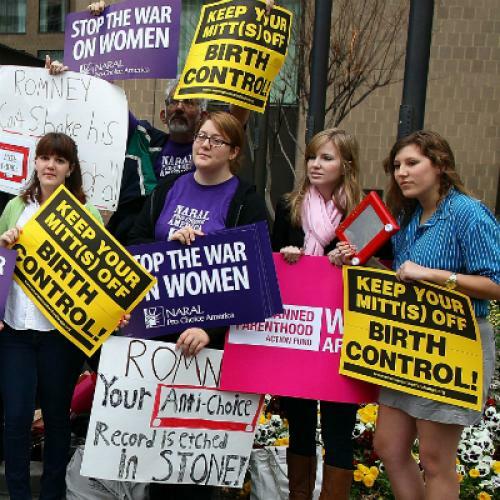 Now Romney has arguably changed his position on his approach to abortion as a candidate for a mind-boggling TENTH time. Compare that to Obama, who has certainly gone back on his fair share of campaign pledges. But on health care reform, his signature achievement, Obama has been both clear and consistent (with the exception of the individual mandate, which he did not embrace until after he was in the White House). Health care reform was not terribly popular, yet Obama campaigned on it in 2008, made it a key part of his agenda against the advice of many of his top aides, and staked his presidency on passing it, losing Democratic control of the House in the process. You can criticize Obama and criticize his health plan, but you can’t argue he said whatever it took to get elected and stay popular. The most unsettling aspect of Romney’s willingness to turn on a dime and lie without blinking an eye—and on an issue that most people consider one of the most morally fraught positions an individual can hold—is that it leaves voters with absolutely no idea what he would do as president. That’s surely the point. If you support abortion rights, Romney wants you to believe that he’s the liberal guy from Massachusetts who wouldn’t really humor those crazies in his party, even if that would mean vetoing restrictions on abortion. And if you believe abortion should be illegal, Romney wants you to think he does as well and that he would appoint justices who would overturn Roe v. Wade. What does Mitt Romney believe? What would his agenda look like as president? Is there anything he wouldn’t be willing to say or sign if it proved politically useful? These aren’t gotcha questions. These are the bare minimum specifics that voters need in order to cast an informed vote. Like everyone, I would rather not be governed by a president whose convictions are contrary to my own. But I’m terrified of being governed by a president who doesn’t have any moral convictions at all.